The SF Go Club is starting a new 10-week beginner’s course this Sunday, March 20th, club president Mishal Awadah told the EJ. “This is a new approach to teaching and we hope to have a great class of beginners’ learn the basics of the game together.” More information about the course as well as a flyer for distribution can be found at http://sfgoclub.com/go-for-beginners/. Topics include the rules, capturing stones, eyes and living groups, shape, ladders, ko, seki and sente vs. gote. The lessons run from 2:30 to 3:30 p.m. each week. 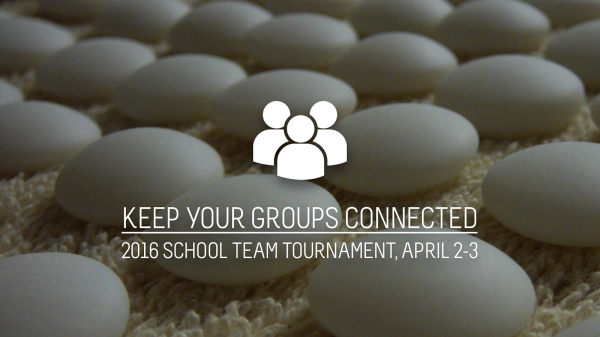 The registration deadline for the School Team Tournament (STT) is right around the corner. 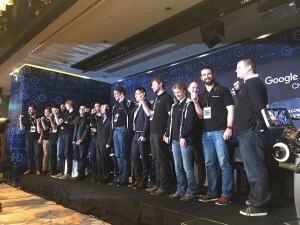 “The STT is one of the most interactive and competitive tournaments for students in high school or below,” says American Go Honor Society President Yunxuan Li. “It draws many schools every year and has always been enjoyed by young players. All you need to do is gather 3 players from your school and sign up to compete!” To register, click here. Registration will end March 23, and the tournament will take place on KGS on April 2 & 3. The 1st round starts at 9am PST, and the 2nd at 1pm. Rounds 3 and 4 follow the same schedule the next day. Time settings are 45 minutes main time and 30 seconds of byo-yomi 5 times. Please remember to indicate your accurate AGA rank or your KGS rank. If you register with your KGS rank, please make sure you have at least 10 games on your account before the tournament. “Which team will be the next to win top honor for their school this year? We will find out soon,” adds Li. 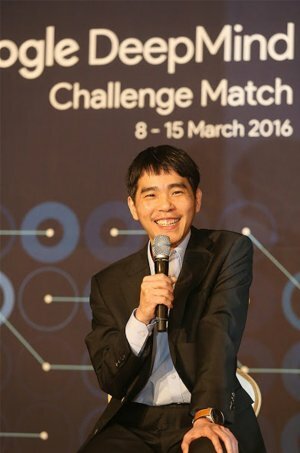 Lee Sedol 9P made a comeback Sunday after three consecutive losses, to beat AlphaGo in the fourth game of the Google DeepMind Challenge. 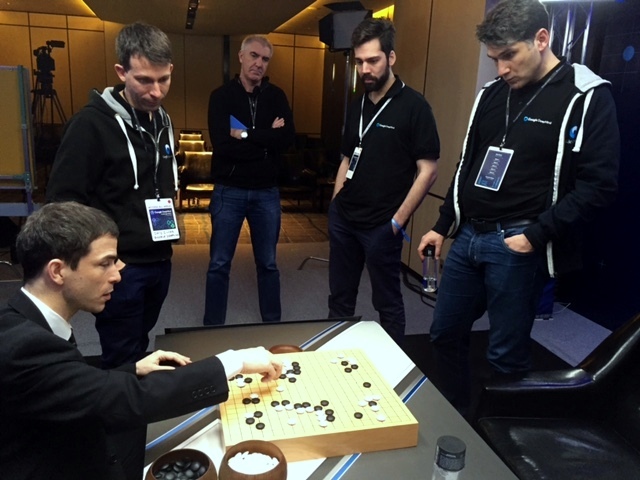 Playing as white, Lee won by resignation after 180 moves. AlphaGo held a strong position for the first half of the game, but commentators noted that Lee Sedol played a brilliant move 78, followed by a mistake by AlphaGo at move 79. 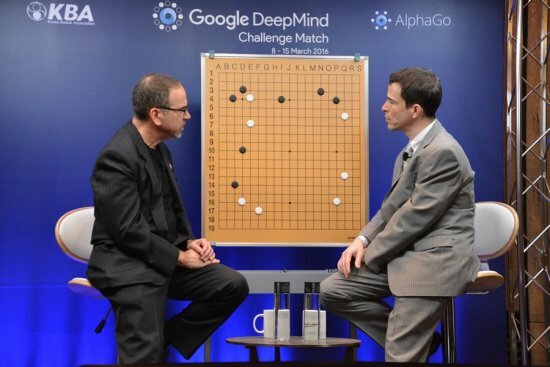 “Today’s game was another example of AlphaGo playing a very interesting, good game,” said English commentator Michael Redmond 9P. 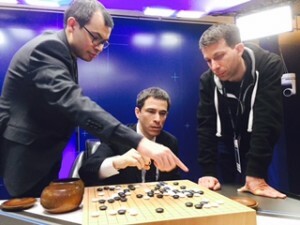 “However, move 78 by Lee Sedol was really brilliant — and enabled him to win.“ Song Taegon 9P, the Korean commentator, said that “It seems Lee Sedol can now read AlphaGo better and has a better understanding of how AlphaGo moves. For the 5th match, it will be a far closer battle than before since we know each better. 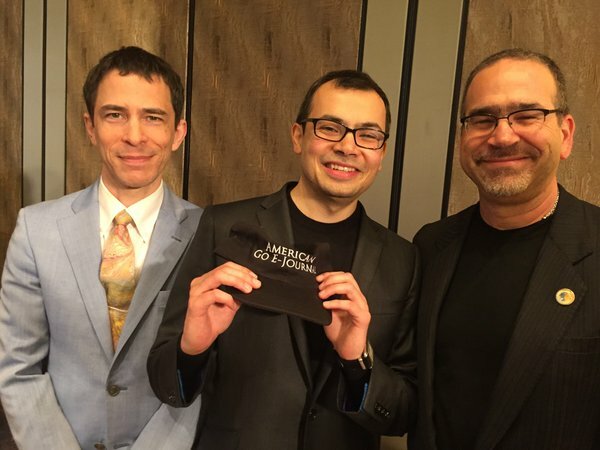 Professional go players said that they became more interested in playing go after witnessing AlphaGo’s innovative moves. People started to rethink about moves that were previously regarded as undesirable or bad moves. AlphaGo can help us think outside of the box.“ As in the previous games in this match, Lee used up all of his time and two periods of byō-yomi overtime, playing nearly two hours on his last period. 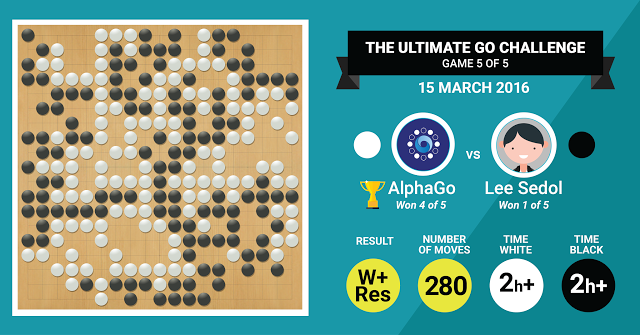 With the match score 3-1, AlphaGo has already secured victory in the Google DeepMind Challenge Match, but Sunday’s loss heightens the drama going into the final game, Game Five, which will be played on Tuesday, March 15 at 1pm KST. photo (left): AlphaGo’s Demis Hassabis and David Silver review Game 4 with Michael Redmond 9P; photo by Chris Garlock. 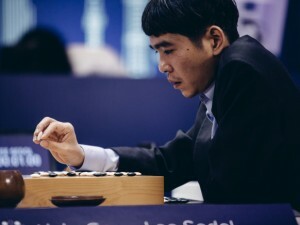 photo (right): Lee Sedol, courtesy Geordie Wood for Wired. 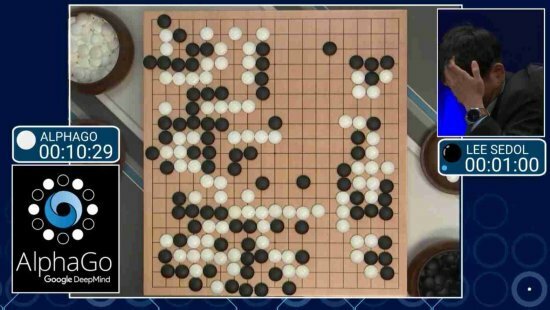 Click here for Michael Redmond’s Match 3 Game Highlights and here for the Match 4 Livestream commentary by Michel Redmond 9P with Chris Garlock. Click here for complete commentaries on games 1-4, as well as brief game highlights for each round. - includes reporting by Sam Byford in The Verge. 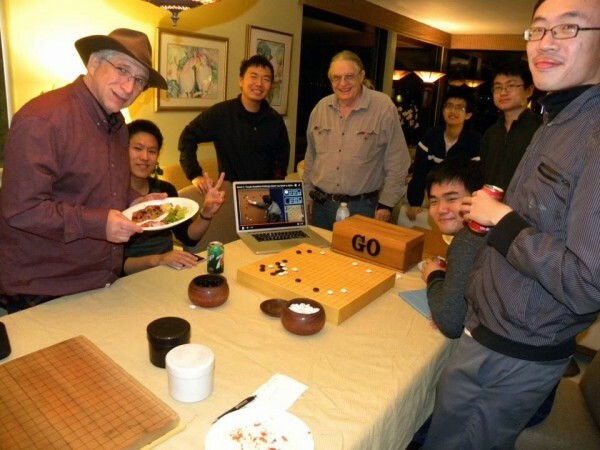 Click here to see the game commentary by Michael Redmond 9P with Chris Garlock, Managing Editor of the American Go E-Journal. photo: Lee Sedol with DeepMind CEO Demis Hassabis (left) and Alphabet president Sergey Brin after the third game in the Google DeepMind Challenge. Iyama’s new record for prize money: Iyama Yuta has set a new record for most prize money won, which is not surprising, considering he won six of the top seven titles last year, as well as the Agon Kiriyama Cup. This is the fifth year in a row he has topped the list and the fourth year in a row his total was over 100 million yen. The top ten at the Nihon Ki-in are given below.